Among other things, in this post, I figured I'd finally post a pic of "The Boxy Lady" Micro-mobile cabin that ran in the NY Times/New York Times as part of "The $200 Microhouse" article (photo by Erik Jacobs). I just love this one particular shot. 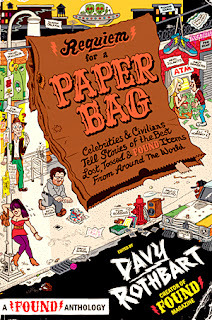 Anyhow, on a tangent of curb-cullin', sidewalk scrounging, and dumpster diving (The Boxy Lady is made out of a majority of recycled materials), I've been re-reading "The Art and Science Of Dumpster Diving"- which is a great, humorous, and offbeat read, EVEN if you never plan on going anywhere near a dumpster. I def. 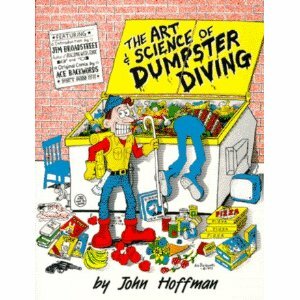 reccommend this book as a glimpse into the insight and life of one who (John Hoffman) has been at this for years and years. 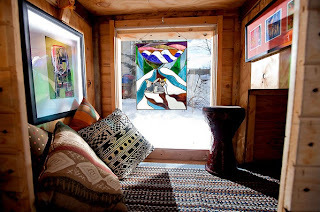 It also very much so applies to us who seek to incorporate recycled materials into our building projects- on principal, or for the simple monetary-savings aspect of things. In terms of "finds", I'm also currently reading "Requiem For A Paper Bag"- a book which I found NEW for $2.99 at Ocean State Job Lot (a seconds/bargain-type store originally from RI). This book's great, in a very guttural and "street"-raw, and sometimes-obscene and very "REAL", way- dealing with the tales (from mostly celebrities) of FOUND items, ranging from bizarre photos and notes, to rare car parts (who knew Chuck D from "Public Enemy" was a junk-diver?). Its also got THE BEST cover art I've seen in a long time- very remaniscent of Al Jaffee from Mad Magazine. Davy Rothbart, creator of FOUND MAGAZINE, pieced this together, and its quite the eclectic, weird, edgy, and down n' dirty, read. Great concept- and you can check out his related site at FOUND MAGAZINE.